Hello I am running PLEX Server on Open Media Vault. When I try to set up my libraries I can see my Open Media Vault (NAS) Server. I can see a folder called 'Storage' but inside 'Storage' I have a have a folder called 'Music' and the 'Music' folder isn't showing. Fix the permissions. There is a reset permissions tab in shared folders installed by omv-extras. I had the same problem. This thread here from WastlJ helped me. But when you do this you have to restart the server otherwise it won't work (at least it was in my case). I have tried to import my library but only five albums have shown up. Any thoughts what might be causing this? How can I get all my albums to show up? 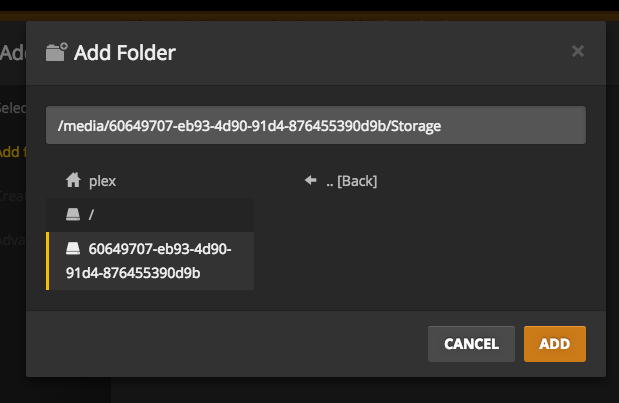 Is all your media properly named in accordance with Plex naming conventions? Is there a way to have a script to check if Plex is running?